2015 Wave B Hidden Mickey for the Walt Disney World Resort. This is Elliott from Pete's Dragon. He is smiling and holding an apple. He is shown on an olive green background with a silver hidden mickey on his left. 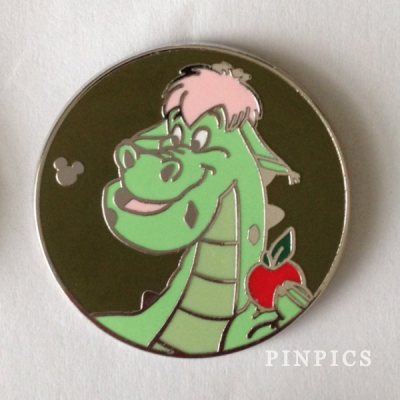 Disney Dragons Hidden Mickey Pins are 112164, 112165, 112166, 112167, 112168. Chaser is 112148. This pin is available for review. We encourage community participation and appreciate your thoughts on this pin! Once your comments are approved by a moderator, they will be posted. If appropriate, you may add Counterfeit Notifications to this pin. Once approved by the moderator, they will show up. © 1999 - 2015 PinPics®, All Rights Reserved*.